WAFFLES: Hello Ladies. I'm just hanging out here on the big round rug, being all handsome and stuff. 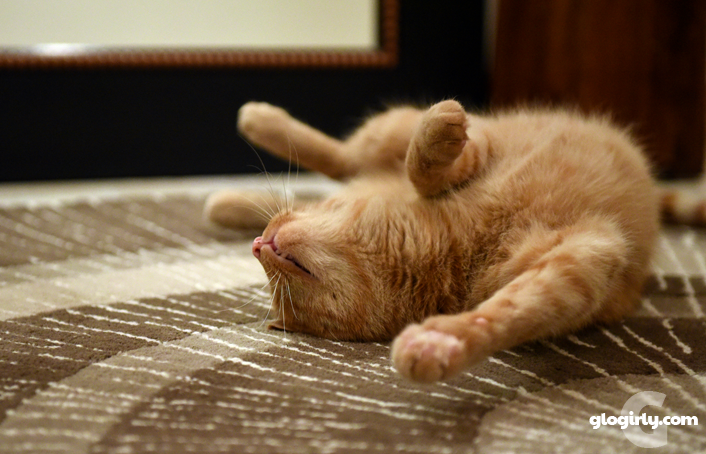 For most cats, reaching all the right spots during bath time requires mastering a few simple yoga poses. Waffles is definitely not most cats. He has his own unique bathing technique we call the Flip-N-Roll. He flips and flops on his back, almost like a fish, while licking everything from his arms to his tummy to...well, you know. He'll often throw in a chortle or two for good measure. 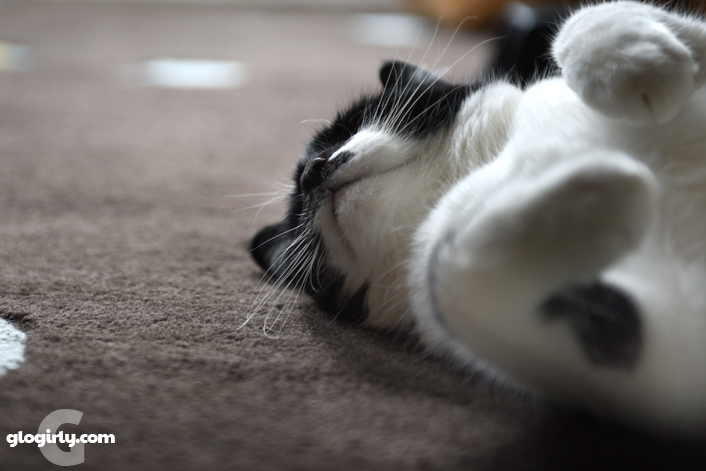 He may be a little goofy, but he's got the cleanest armpits of any cat we know. 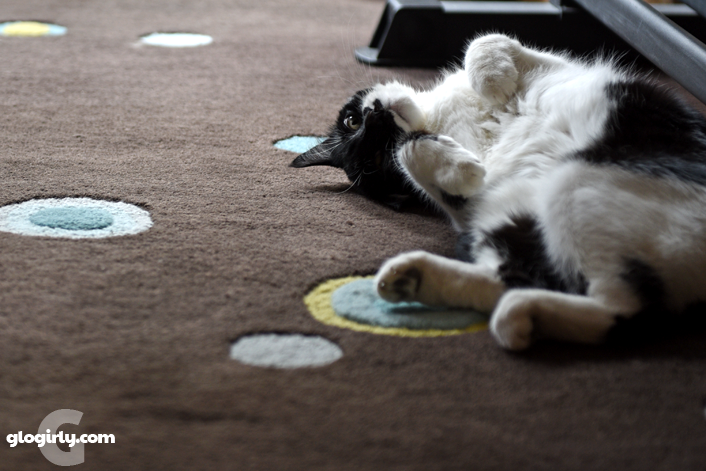 Katie, on the other paw, prefers lounging on the rugs. When she flips and rolls, it's all about inviting love. Whenever Glogirly or Gloman walk near Katie and one of the rugs is within sight, she beelines to the rug, flips over and opens her arms, just waiting for them to join her on the rug for some love and tummy scratches. I like to flip and roll just because it feels so good! Company is welcome but not absolutely necessary. We flip fur tummy rubs here. Hey, different strokes for different folks...errr rather...cats. Waffles, I'm not sure my human can take that much handsomeness! Valentina is a big drop, roll and flip kitty! Does it as soon as Z-Girl comes home, and for all the cat sitters!!! Coco loves to lay down and roll over to sleep with her belly exposed but DON'T dare touch her (unless you are Z-Girl and even THEN, caution!!!) 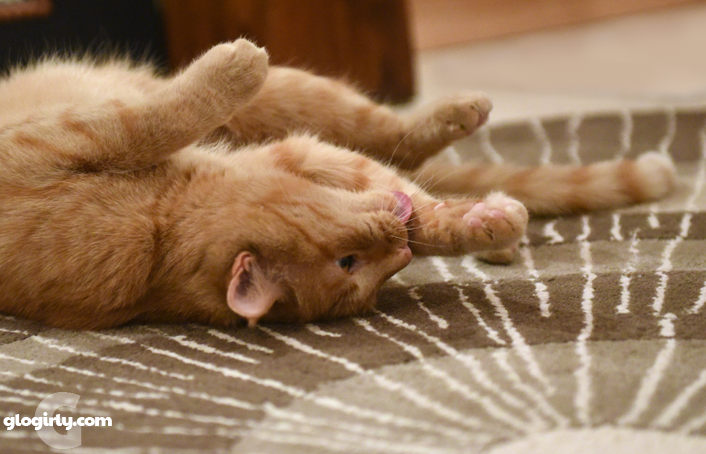 We think that Waffles is so cute the way he flips and rolls to take a bath!! Katie, you sure have purrfected getting the attention you want when you want it!!! I'm with Katie. 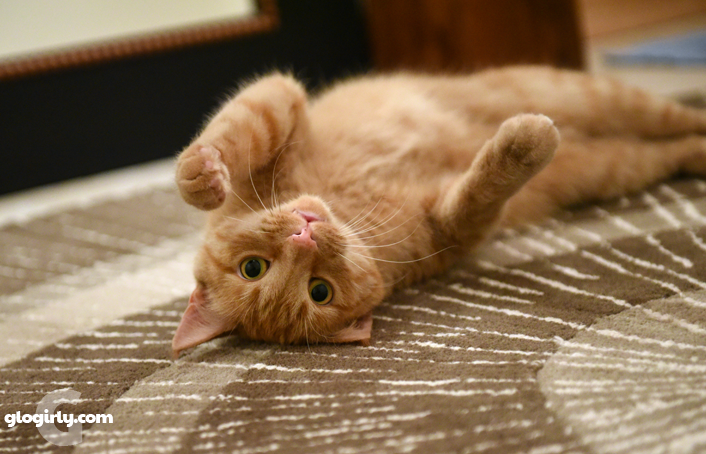 I do the drop and roll when I want attention but you'll get a surprise if you try to touch me. Everyone has their own ways. Waffles, do you get tummy rubs, too, or is that area off-limits? I'm a yoga clean kitty.